MUMBAI – MAHARASHTRA – INDIA DECEMBER 10 , 2011 03.00 P.M. It is centenary year of Ashok Kumar , the first real Super – Star of Hindi cinema . He made his debut in 1936 , just after 5 years of the release of ‘ Alam Ara ” [ 1931 ] , the first talkie of Hindi cinema . Born as Kumudlal Kunjilal Ganguli in Bhagalpur city of the then Bengal Presidency [ Now Bihar ] , Ashok Kumar spent his early life in Khandwa , Madhya Pradesh , where his father was a practicing advocate . He was educated at The Presidency College of Calcutta [ Now Kolkata ] . His two younger brothers ; Anoop Kumar and Kishore Kumar were also singer actors . After graduation , he came to Mumbai [ Then Bombay ] and started working as lab assistant in Bombay Talkies , where his brother – in – law Sashadhar Mukherjee was working with the owner Mr. Himanshu Rai . 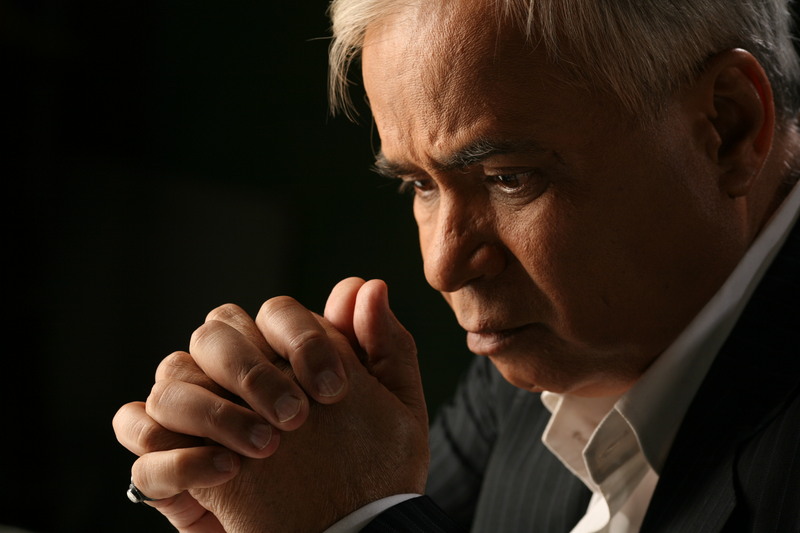 He , accidentally , started his acting career in 1936 with the Bombay Talkies film ; ” Jeevan Naiya ” . As the story goes , the original hero Najam Ul Hassan eloped with Devika Rani , the heroine of the film and wife of Himanshu Rai . indignant Himanshu Rai was furious and dismissed Najam Ul Hassan from Bombay Talkies . One day he saw Ashok Kumar and decided to make him the new hero of ” Jeevan Naiya ” [ 1936 ] . Another film , ” Achhut Kanya ” , which also came in the same year , was super hit and with this success Ashok Kumar was catapulted to super – stardom . 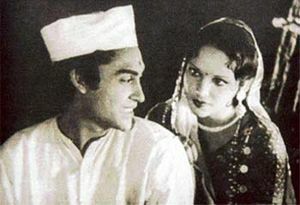 After ” Achhut Kanya ” [ 1936 ] , Ashok Kumar and Devika Rani were paired again in hit films like ” Izzat ” [ 1937 ] , ” Savitri ” [ 1937 ] and ” Nirmala ” [ 1938 ] . 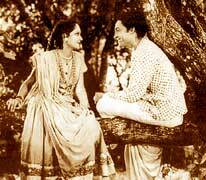 Later on he was paired with Leela Chitnis in super hits like ; ” Kangan ” [ 1939 ] , ” Bandhan ” [ 1940 ] and ” Jhoola ” [ 1941 ] . He played Hindi cinema ‘s first anti – hero role in ” Kismat ” [ 1943 ] , which ran for 3 continuous years in the Roxy cinema of Calcutta . [ Now Kolkata ] . This record was broken by ” Sholay ” [ 1975 ] , which ran in Minerva of Mumbai for 5 years . Before ” Kismat ” [ 1943 ] , he sang all his songs in films , as was the norm and churned out some outstanding numbers . I have a cassette of the songs sung by him in his earlier films . Years later , he again sang in ” Aashirvad ” [ 1968 ] . His song ” Railgaadi …..chhuk , chhuk , chhuk ……… railgaadi “ was a rage and is considered the first Rap song of Hindi cinema . After ” Mahal ” [ 1949 ] , he left Bombay Talkies and started his career as freelance artiste . He started playing character roles from late 60s . Even as a character artiste , he churned out many marvellous films with some stellar performances . ” Aankhon Me Tum Ho ” [ 1997 ] was his last film . Thus , from ” Jeevan Naiya ” [ 1936 ] to ” Aankhon Me Tum Ho ” [ 1997 ] , he had a career span of 61 years as an actor . This is unparalleled in the motion picture history . It was a record , which got eclipsed recently . Dev Anand , who died on December 04 , 2011 , had career span of 65 years as an actor . In his 61 year-long acting career , Ashok Kumar acted in 301 films . With the advent of television , he whole – heartedly accepted the new medium and in fact was the first major cine – artiste , who appeared in serials . First he anchored ” Hum Log “ and then did title roles in TV serials like ; ” Bahadur Shah Zafar ” and ” Bheem Bhawani ” His last TV serial was Hrishikesh Mukherjee directed ” Ujale Ki Ore “ . I also did a very insignificant role in it and can say that I have shared screen space with Evergreen , iconic and gigantic super star , Padma Bhushan Ashok Kumar , who was affectionately called , by one and all , Dadamoni , meaning elder brother . He , apart from acting in 301 films , produced 4 films . They are ; ” Mahal ” [ 1949 ] , ” The Fiancee ” [ 1953 ] , ” Kalpana ” [ 1960 ] and ” Lal Chunariyaa ” [ 1983 ] . He even directed ” Eight Days ” [ 1946 ] but due to some reasons refused to take credit . He is not billed as a director in the credits . He also contributed in music department of 4 films . They are ; ” Aashirwad ” [ 1968 ] , ” Kangan ” [ 1971 ] , ” Khubsoorat ” [ 1980 ] and ” Shaukeen ” [ 1982 ] . In ” Krorepati ” [ 1961 ] and ” Guddi ” [ 1971 ] , he is billed as guest artiste and played himself . It means , he did not play any character but played super – star Ashok Kumar . Apart from acting , his other passions were painting and Homoeopathy . He was a practicing homeopath . In 1950s , he also became owner of iconic Bombay Talkies , when Devika Rani sold her share and left the studio . He was a linguist and apart from English , Hindi and his mother tongue Bengali , was fluent in Marathi and French . In his film ” Gumrah ” [ 1963 ] , he even used French in dialogues . A career span of 61 years , 301 films in Hindi , Bengali and Marathi , various ads and corporate films and half a dozen TV serials , apart from numerous film songs to his credit , this gigantic , iconic Super – star of Hindi films died on December 10 , 2001 in his Chembur residence . He was 90 years old at the time of his death . First film of Ashok Kumar , which I watched was ” Bahu Beti ” . I was in school and went to watch this Joy Mukherjee and Mala Sinha starrer . Ashok Kumar , who was not the hero of the film , was there prominently on the poster and his name came first in the billing . I got curious . How come an actor , who is playing father in the film , got the top billing ? My cousins , my maternal uncle and some more knowledgeable friends told me about Ashok Kumar and I started watching his films and started following his career . Initially I was a fan of Dilip Kumar . I am still a fan but slowly I started veering towards Ashok Kumar and Dev Anand . When I came to Mumbai to pursue career in films I watched Ashok Kumar and Dev Anand from close quarters . I found them humane , warm and without any trappings of a star . I wanted to be close to my icons and these two stars ; Ashok Kumar and Dev Anand permit you to be there in their world . So I became a huge fan of Ashok Kumar and will remain till my death . This is centenary year of Ashok Kumar . It is sad and appalling that nothing was done to commemorate the occasion . There was just one article in Times of India . Congress government at centre is more interested to preserve the legacy of Nehru – Gandhi family . They have no time for Ashok Kumar . But alas ! Hindi film industry too forgot its first Super Star . MAMI Film Festival also forgot to give him honour in his centenary year . I am a small man and I have no reach . Still I wanted to write a blog about Ashok Kumar . 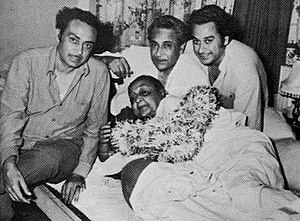 Through my blog , which is not widely read , I wish to remember Dadamoni Ashok Kumar and paying my unflinching respect to the first real super star of not only Hindi cinema but of Indian films . Adieu Dadamoni ! You shall always be remembered by a fan like me and your incredible body of work will always be there to enthrall the connoisseurs of world cinema . Yes Sir, Dada Moni has always been my most favorite star since my childhood. His action in Kismat is incomparable , and who can forget is rap in Ashirwaad. Became emotional after reading your blog on Ashok Kumar sahab.My only favourite actor till now.Infact I am in search of biography on him and his book on film acting which neither publicised nor available.Have you any idea from where these books can be procured?